Orphaned at a young age and raised by humans in the slums, the elf Merisiel has seen many friends grow old and die in the decades it took her to become an adult. She believes in experiencing life to the fullest, for you never know when you'll meet an unexpected end. Before Combat Though something of a show-off, Merisiel understands the value of hiding in order to get the drop on her opponents. 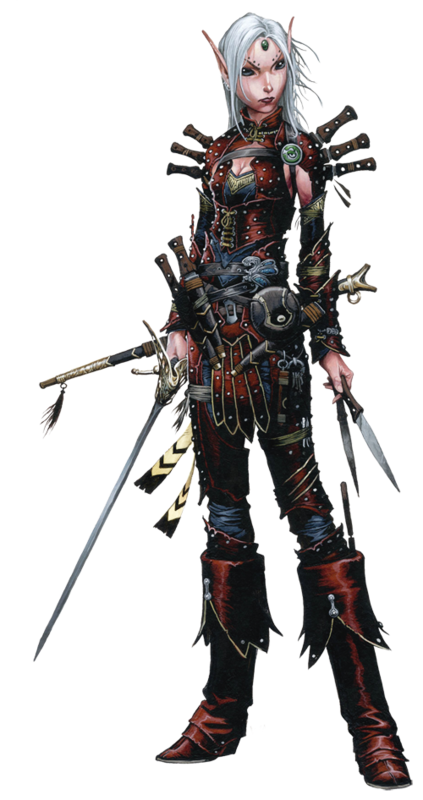 During Combat Merisiel makes sneak attacks on her foes to maximize the damage she can do with her daggers and rapier. The elves have a name for elven children unfortunate enough to be born and raised in human society—the Forlorn. Merisiel is one of these, born in the Varisian city of Magnimar to elven parents who were either unable or unwilling to raise a child on their own. Merisiel never learned the truth of it, for her parents left her in the care of the city's temple to Calistria. The priests raised Merisiel as a ward of the temple, but she had little patience for teachers and prayer. Eventually, she left the temple and spent many years on the streets of Magnimar, earning a living as a freelance thief. When her growing reputation as a thief became inconvenient, she decided to leave her home city to seek out new settlements to explore and enjoy. Merisiel became a master at stowing away on ships, talking her way out of trouble, and finding her way in new societies. She's called dozens of cities home, leaving one for another when her companions outgrew her or she outlived them. Life has been hard for Merisiel, made more so by the fact that she's always found it difficult to master skills that come easily to her companions. Faced often with situations where a quick tongue or stealth won't suffice to keep her out of trouble, Merisiel has taken to carrying dozen knives. When things go wrong with her carefully laid plans (as they almost always seem to do), the knives come out and what needs to be done gets done. To date, Merisiel hasn't met a problem that can't, in one way or another, be solved with a blade. Each of the cities she's spent time in carries special memories for Merisiel. In cosmopolitan Kintargo, she fell in love for the first five times, but only the last of those relationships survives to this day. In bustling Corentyn, she spent five years in prison for a crime she wasn't able to pin on someone more deserving, a sentence exceeded by her stay in Almas (still her record—ten years in jail). In Cassomir she helped rob a corrupt jeweler, in Oppara a decadent and cruel magistrate, and in Sothis a narrow-minded priest of Abadar. Yet in each of these cases her companions betrayed her and left her penniless. She spent many years in Katapesh and Absalom, but the size of these cities eventually grew to be too much even for her. Recently, she's come home to Magnimar with a new purpose in life. Finally matured to the point where she's willing (and perhaps able) to learn from her mistakes, she hopes to make something more of her life than merely bad decisions laced with periodic bouts of excitement and fun. Merisiel's life experiences have taught her to enjoy things to their fullest as they occur—it's impossible to tell when the good times might end. She's open and expressive, always on the move and working on her latest batch of plots to make easy money. In the end, it comes down to being faster than everyone else—either on her feet or with her beloved blades. She wouldn't have it any other way.